To subscribe to FTL’s monthly newsletter or receive updates on upcoming events, click here. Wondering what you might have missed? Don’t worry, you’ll see these events again. Check out photos from FTL’s inaugural Summer Picnic! at Barnum Park in Denver, CO, here. 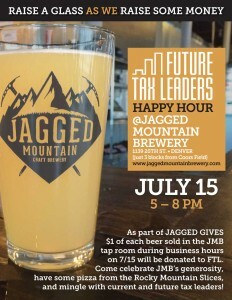 Jagged Mountain Brewery will donate $1 from every beer sale on July 15 to FTL. Join FTL in celebrating JMB’s generosity with FTL and mingle with other Tax, Finance, and Accounting professionals. Entrance is free but the alcohol and food is not. Add it to your calendar here. June 30, 2015 | 12:00-1:00 pm. Current trends in nexus, both sales and use tax and income tax. 50 minute course led by Bruce Nelson, a Tax Director and SALT leader at EKS&H, hosted by EKS&H and catered by Quiznos. Vegetarian, Gluten- and Lactose-free options will be available. Qualifies for 1 hour of CPE. This event is free! Register to attend here. June 21, 2015 | 11:00 am-1:00 pm. Enjoy a mostly flat 3.2 mile scenic hike through Pine Valley Ranch Park concluding in a stream-side cook-out – including S’mores! – catered by FTL. This event is free! Register here. June 9, 2015 | 6:30-8:30 pm. FTL’s first club event! 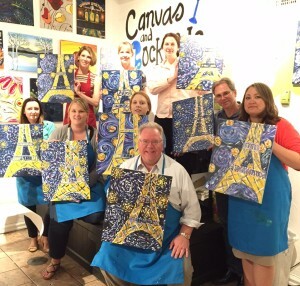 Join us in painting and libations at Canvas & Cocktails in Cherry Creek. Pricing is discounted even for non-members. $15 for members / $30 for non-members. Register here. 4/16/2015 | 4 to 7 PM | Lime in the 16th Street Pavilions. Celebrate the end of April 15 filings and have a chance to win great prizes, including a $100 cash card, at FTL’s Spring kick-off event at Lime. $10 at the door/$8 for early registration. For more information, contact Info@FutureTaxLeaders.org. 3/19 & 3/26/2015 | Noon to 1 PM | Downtown Denver. By invitation only, FTL roundtables tap local leaders for feedback on FTL initiatives. The feedback is used to design FTL’s programs so that they best serve the community and FTL’s members. FTL roundtables are an opportunity for local leaders to shape FTL programs and the tax professionals participating in them while networking with other leaders over lunch. 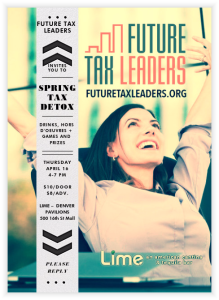 For more information, contact Info@FutureTaxLeaders.org. FTL will be holding a roundtable-lunch in a 16th Street mall restaurant from noon to 1 pm on Friday, February 20th, 2015, seeking feedback from professionals interested in mentoring opportunities, as a mentor or being mentored. This will be an opportunity to connect with other Tax and Accounting professionals while helping FTL form a program that will be applied by its chapters across the country. If you are interested in participating, please contact AshbyWalters@FutureTaxLeaders.org. Space is limited.